Looking back on 2014, I cant help but think of some of my most memorable foodie experiences. Some of these experiences spanned different countries and cities. Some were joyous and one was particularly painful. Lets get the most excruciating out of the way first. A lovely weekend at Shoreditch was mirred by the Red Dog Saloon’s Hot Wings Challenge. If you have a romantic evening planned, stay away from this challenge. The waiters subtle warning, my girlfriend’s pleas, the heat permeating through my gloves and the smell of Naga Viper all made me excited about taking up this challenge. What madness! The excitement soon turned into streaming tears and painful howls 2 wings into the meal. The third wing brought blindness as I rubbed my eyes against my better judgement and by the fourth wing I was yelling for somebody to help me as it felt like a massive alien was trying to make it’s way out of my chest. That wasnt the end of it however, 5 hours later I was on the floor screaming in the hotel room as cold sweats covered my shoulders. What an experience indeed. I came, I saw and I nearly lost my mind. 6 Hot wings Naga Viper challenge: I brought my brothers back here 3 months later. One of them ran out of the restaurant like a bat out Hell. Quite funny actually. Clos Maggiore was voted as London’s most romantic restaurant in the Hardens guide 2014. I still dream about the truffle mash once in a while. Food aside, they have an extensive wine list. Very tasty chicken , addictive fries and a caramel dessert always does the job for me on saturday afternoons.Tramshed definitely deserves a mention. 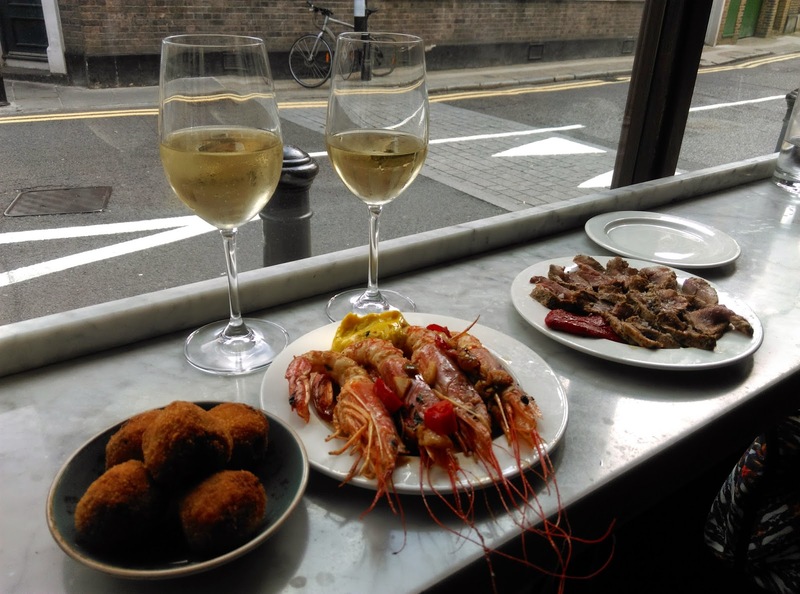 I spent an afternoon at Jose Pizarros restaurant and Tapas bar in Bermondsey. I totally enjoyed all the dishes on offer. I mopped up the Gambas dish with a soft piece of bread. This dish was definitely one of the best dishes on the menu. I cant recommend this restaurant enough. Other restaurants worthy of mention are Brindisa (Been a few times) and Baraffina (visited earlier on in the year). I plan to review Baraffina properly in 2015. I love visiting borough Market a lot and I have to say that this is one of my fave spots in the market. I had the pleasure of taking my friends on a tour of the market a few months ago and they totally had a good time. The Oysters were delicious and the customer service stood out as the waiter took us through what Oysters to try out. Japanese: Raw oysters with Soy, Ginger and Wasabi. Local craft beers, flavourful sunday lunches and one mean sticky toffee pudding places this pub firmly on my list. Afternoon Tea at Fortnum and Mason was a great experience. Nice array of tea selections, lovely cakes and well made Sandwiches really helps makes this place a favourite of mine. Beats the Palm court in my opinion. I had some nice dishes at some very good restaurants abroad. We found this restaurant in the Opera area just by chance. They serve sweet or savoury crepe-like bases filled with tons of delicious food. Every mouthful was mouth watering. This restaurant is based in the montmarte area of Paris. I liked the relaxed atmosphere and the stand out meal for me was their Pour les indicis entree, or more specifically the Velute de laitue-a Basil and Yoghurt mixture sprinkled with Chorizo. The tiramisu was quite moorish. This restaurant serves delicious local cuban cuisine at very affordable prices. It may not be the most attractive place from the outside but it is the place to be if you want some very well made comfort food. After eating at a few pricey tourist traps on South beach, this restaurant a few blocks away really struck a chord with me. A nice walk along the Triana bridge brought us to this lovely restauant. Very good food indeed. Exceptional Tapas served at this restaurant near the Cathedral. The rice paper triangles stuffed with cream cheese, prawns and leeks was simply delicious. Visit this restaurant if you can. You won’t regret it. There goes my list and i hope you’ve enjoyed the blog so far. I cant wait to visit more restaurants in 2015. Do you have any 2015 restaurant suggestions?.If so i would love to hear about it in the comments section below.